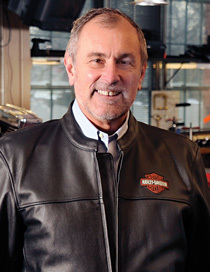 Harley-Davidson CEO Keith Wandell talks to Brittaney Kiefer about the importance of connecting with the customer at retail level. Discuss changes you've implemented since becoming CEO in 2009. The overall change and idea was to focus strictly on the Harley-Davidson brand. Rather than dilute our focus on initiatives around other brands, we felt we should focus on making Harley-Davidson all that it can be. We divested ourselves of a couple of other brands we were spending money on and trying to grow, such as the Buell line, and reorganized in many ways to make sure we could drive the strategies we had developed. We're going through a transformation in three main areas: product development, manufacturing, and retail experience. How are you improving the retail experience? We've asked ourselves: How do we make sure that every customer has that unique, personalized, and great customer experience every time and every day in the world? Currently all executives at the director level and above are going through our Walk a Mile initiative. Each executive has to go to a dealership and work in various divisions for a week. Then they come back and say what we have to do as a company to help our dealers work better. This is the first year we've done the program, but we hope to continue it. How central is the idea of community to your brand? Community is at the core of what makes our brand great. We're not really selling products – we're providing an experience for life. That's how we look at it, and community becomes a big part of that. Even though you may like the idea of personal freedom and individuality, when everybody comes together, there's a sense of one. We're all in this for the same reason, which is to have this experience that Harley-Davidson provides. We host events around the country for our riders including boot camps, riders' education classes, and Jumpstart, a demo riding experience where people can test bikes in a stable position and get more comfortable with the concept of riding. To our business, it's extremely important, probably more so than a lot of companies because of the iconic nature of the brand and passion our customers have around it. It's an amazing thing to watch because everybody loves to write about Harley. However, we have to make sure we're very clear in our messaging because it's too easy to have somebody else tell the story for you. Next year we're celebrating our 110th anniversary with an event in Milwaukee on Labor Day weekend. We plan to draw people from around the world. It's an opportunity for us to showcase the undeniable power of the Harley brand. How does the company use social media? Social media has become a much larger part of what we do, in part because one of our key objectives is to bring more young riders into the family. We have 3.9 million Facebook fans, more than half are under the age of 35. We also have 80,000 followers on Twitter. We have a crowdsourcing application called Fan Mach-ine. With it, riders vote on ad ideas, so they feel more part of the brand. Harley also has an online manual and guide to the riding lifestyle. It is curated by influencers and fans of the brand. It's a way for us to stay close to customers around the world. Talk more about Harley-Davidson's commitment to diversity. Diversity starts with our leaders and what we expect from them in terms of behavior. We hold our employees accountable to respect the ideas and opinions of others. Beyond that, we want to grow our outreach demographics at a faster rate, attracting more female, young, African-American, and Hispanic riders. For example, we host garage parties around the country, and some dealers hold parties specific to women where they can get together, bond, become more familiar with the brand, and not feel intimidated to walk into a dealership.